CrossFit is more than a sport; it is a way of life. CrossFit covers all the aspects of our daily life, from nutrition to the practice of sport: food, moving, jumping, running, carrying external weights, etc. But CrossFit is even more than that, it is the ‘Sport of the Fitness’ and it became so thanks to a community of very passionate people from the farthest corners of the world. You are only a CrossFitter thanks to and because of others, it is the community that makes you a full CrossFitter. CrossFit was able to develop thanks to the full revelation of its methods, results and critics. Internet has been the most important means in order to support the values that we all share with each other. Our charter is an open source, which makes all the athletes and trainers co-developers by means of an on-line community. 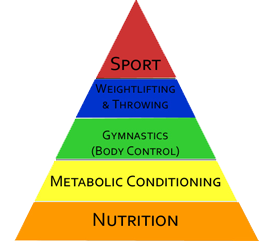 CrossFit is managed empirically, is tested clinically and is developed in community. Greg Glassman, the founder of CrossFit, has defined fitness as follows: ‘the increase of the work capacity by means of a temporary and modal domain’. The ‘capacity’ is the capacity to provide real work, which can be measured by means of basic basic terms with regard to physics (power, distance and time). Life is unpredictable (even much more than sport is) so you have to take care of your health and fitness in a broad and not a specific way, both regarding the duration as regarding the type of exercises in order to be prepared to the unpredictable. We never know beforehand what life has in store for us, that is why each WOD is a surprise as well: you never know in advance which muscles you are going to train that day. 1. Friendship: Our first goal is to become a better version of ourselves, not a copy of someone else. We only have one opponent: ourselves. Our ego is our enemy and the others are our friends, which stimulate us and help us to excel ourselves. Friendship is a greater stimulus than competition. 2. Sincerity: Give the best of yourself during each workout depending on how you feel that day. You can think of a thousand excuses not to do your WOD but if you can think of one reason to do it, it is worth so much more than the thousand other excuses. Always stay positive and leave the excuses in the changing room! 3. Corporate spirit: Regardless of your level, solidarity, game, challenge, help and friendship are the essential values in the world of CrossFit. At the end of each WOD, and regardless of your result, you congratulate your team members and your motivate them to finish the WOD. You are not born a champion, you become one. 4. Honesty: You will always be honest and fair, you will never cheat. 5. Humility: Regardless of your performance you have to keep in mind that there is always someone with a better performance than yours. Helping your weaker partner to become stronger, is your greatest strength. 6. Strength and honor: Everyone has the right to put a knee on the floor and to rest and everyone has the right to get back up and to fight till the end of the WOD. Perseverance and courage are the keywords for success. Every obstacle is our ally, it helps us to become, both mentally and physically, stronger. No pain no gain! 7. Perfection: You learn to know your real values by crossing your limits. Each WOD has to make you nervous before its start, if not it means that the WOD is already too easy for you. Work on your weaker points and make your stronger points even stronger. 8. Respect: Respect yourself, the others and the equipment. 9. Determination: Be determined to give the best out of yourself, to become the best possible version of yourself and to achieve your goals. 10. Virtuosity: Always try to be as perfect as possible.